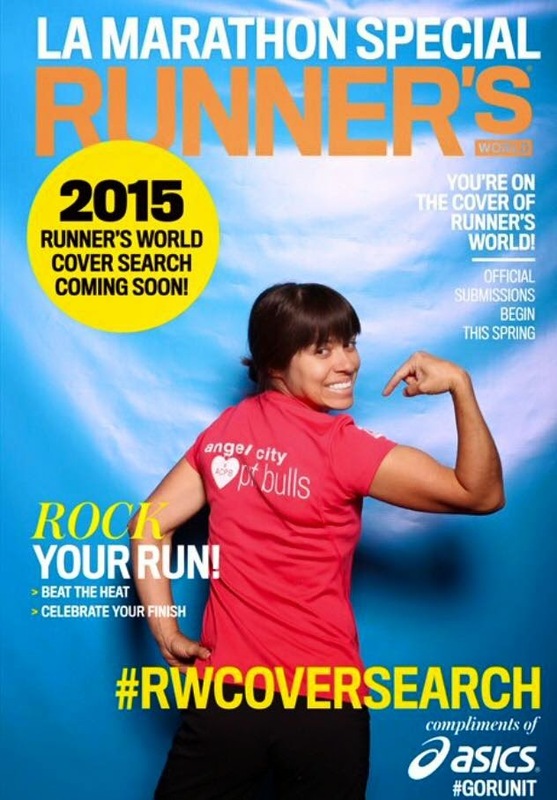 I want to be on the next cover of Runner’s World! Simply put, VOTE EVERYDAY for me!!! Why? You have a choice! Watch that next viral video or spend just a few seconds voting for me and sharing your support. Running is my way to vent the steam that builds up from life. For some people that’s through checkers, under water basket weaving, or a rousing tournament of Thumb War. I enjoy pounding the pavement until I come home with a smile on my face for the husband that pushed me out the door. I’m grateful for my health and to share my adventures with others. Proud to be a team member of Angel City Pit Bulls, and with the same support of friends and family that I’m calling on now raised over $1,200 for this animal rescue group with my last marathon. Whether I win the cover or not, my running adventures and fundraising efforts will continue! Open Invitation: no matter the distance or pace, if you want to run and need a partner I’m game (if you’re local). If you’re not local, I’ll send you a virtual high five and an attaboy slap on the back for your efforts!